Seeds of Orenco, a Ripe Muddy Install day. It was exciting to see the large turn out for the grand opening of the city of Hillsboro and Metro’s new Orenco Woods Nature Park. Rhiza A+D was part of the parks collaborative design team along with Walker Macy landscape architects, Lois Brink of Big Sand Box and Opsis architecture. Along with our design team work, rhiza A+D was commissioned to create an artwork for the park that would be engaging, playful and multi-generational. 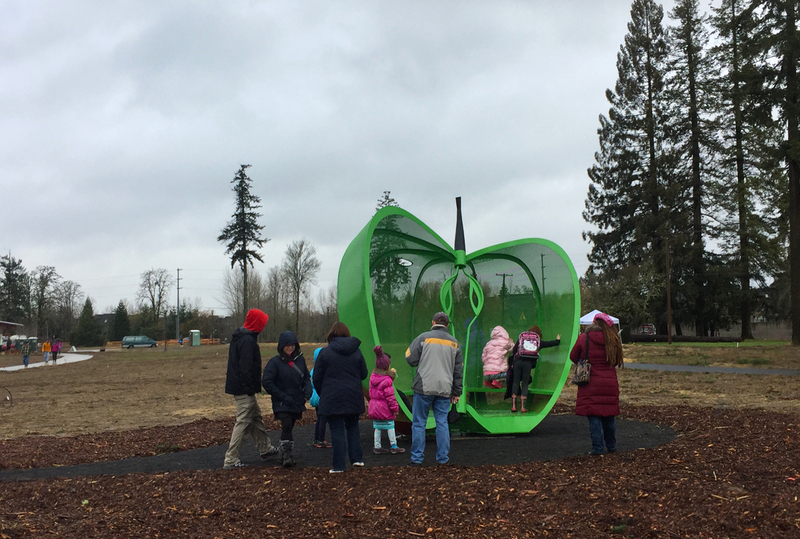 We design, fabricated and installed Seeds of Orenco to be a cultural and playful addition to the park, located adjacent to the “nature play” playground. Across the street from the park is the Orenco Elementary school. It was wonderful to see the kids drawn to and swarming the sculpture all during the dedication ! Along with encouraging play and playfulness the sculpture references the sites cultural history and city of Hillsboro’s origins as the Oregon Nursery Company (Ore-n-co). In the late 1800’s the Orenco Nursery was one of the west coasts largest operations and home to the now heirloom Orenco Apple.